(Small spoilers included) According to the title, I’m reviewing the House of Exorcism here but I better start by saying that the below discussed version is `Lisa and the Devil’ in all the glory like Mario Bava intended it! 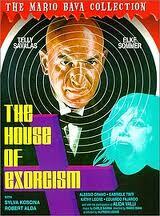 The House of Exorcism adds a whole bunch of needless elements and it doesn’t even credit Bava as a director! Talking about blasphemy! Lisa and the Devil however, is a pure Bava masterpiece and one of the most beautiful horror movies ever made. Like only he can show it, this film breathes a horrific atmosphere of mystery and morbidity. It’s about the young American girl – Lisa – who’s lost in the Spanish city of Toledo. She spends the night in a ghoulish and ancient house with the blind landlady, her vicious son and the spooky housekeeper (a terrific portrayal by Telly Savalas) Lisa is seen as the reincarnation of the lost love-interest of the son and he becomes possessive over her. Unfortunately, the lost lover of son Maximillian wasn’t very faithful and Lisa might take the punishment for that now… Once again, Bava gives a nightmarish portrayal of a sinister setting, filled with bizarre figures and religious themes. Unlike some of his other films, Lisa and the Devil has an intelligent and compelling script that thrills you right from the first second and until the very last. You just stare at this film with wide-open eyes and huge fascination. Beautiful scenery, stunning cinematography and magnificent make-up effects…all trademarks that make horror so great are present in Lisa and the Devil. If you’re looking for breath-taking horror, Mario Bava is the way! Tourist Lisa (Elke Sommer) gets lost in Spain. She accepts a ride from a rich man, his wife and a chauffeur. They break down in front of a mansion with a blind woman (Alida Valli), her gorgeous son (Alessio Orano) and their butler (Terry Savalas). They stay for dinner and really strange things start to happen. The movie looks great. It has beautiful sets, tons of atmosphere (LOTS of fog) and creepy lighting. But the film moves VERY slowly and it’s really confusing until the last half-hour when things start to come together. The big problem is the movie isn’t scary. It’s a HORROR film, but you’d never guess. There are a few gory, scary murders but that’s it. Most of the acting is bad except for Savalas (who’s enjoying every minute of it) and Orano (so incredibly handsome and giving a fine, low-key performance). If you like beautiful, quiet, slow, nonscary horror films, this is for you. The re-edited “House of Exorcism” is much much worse. “Lisa” had a (mostly) understandable plot…”House” doesn’t. New footage of Sommer being possessed is intercut with footage from “Lisa” and it doesn’t work. It’s totally incoherent. Sommer is very good played a possessed woman (I was surprised at some of the things she said) but it can’t save the film. To be avoided at all costs.